Summertime is all about outdoor cooking. From June to September, while the gardens are blooming, the veggies are ripening, and the days yawn slow and long into dusk, I like to be grill-side as much as possible. In recent years, I have started to explore another outdoor cooking method: the wood-fired oven. This type of oven uses both radiant and convection heat to cook. 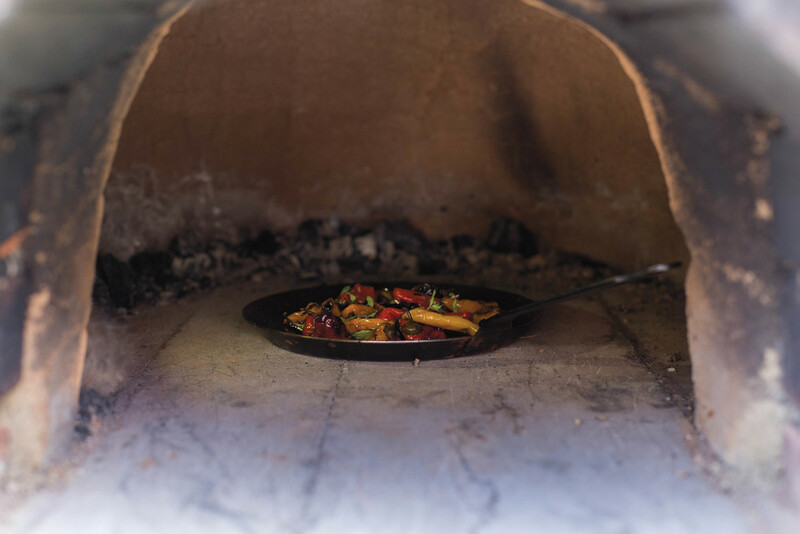 When it’s first heated, a wood-fired oven provides an intense concentrated heat that is great for pizzas, seafood, and vegetables. As it cools, it’s perfect for roast chicken, larger cuts of meat, and potatoes. Finally, a warm oven will bake a pot of beans like none you’ve ever tasted before. The oven is heated by a fire built inside its vault. Once the oven is fully heated, the coals and ash are swept out and the radiant heat emanating from the interior does the cooking. 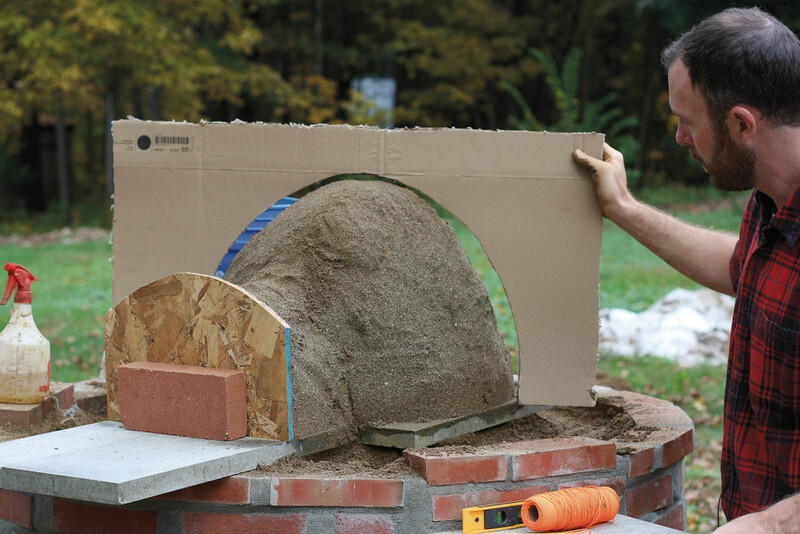 Building a wood-fired oven may seem like a daunting project, but it’s something any motivated DIY-er could tackle. Depending on the weather, it could take about four to six days to build, but the work can be spread out over several weekends. You don’t need a lot of special equipment, but enlisting a group of friends to help is a great idea! 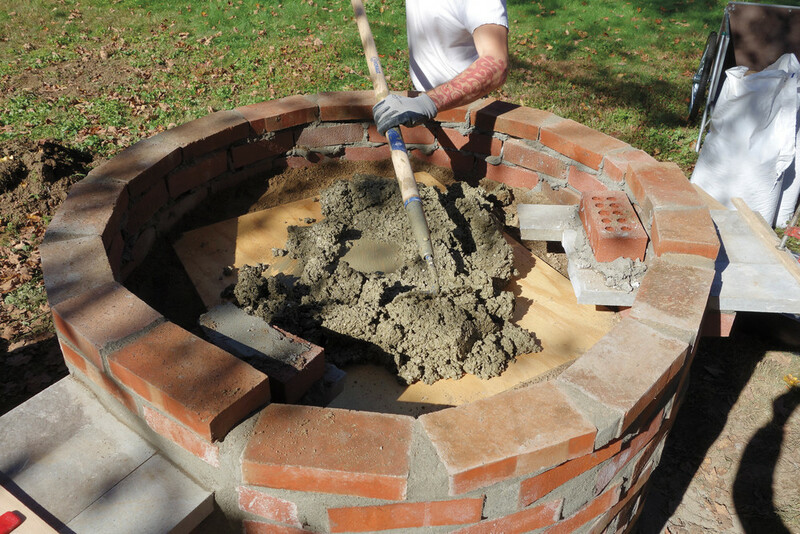 We spent several days with Ashley Schenk of Broadfork Consulting as he built an oven in his backyard. Your oven should be located in an open area. For safety’s sake, build at least 10 feet from any structure and in an area where there is no tree cover. This oven doesn’t have a chimney, so flying sparks shouldn’t be an issue, but it’s best to play it safe. First, you’ll excavate the area under your foundation. You can’t escape New England winters, even when building an oven in the summer, so be sure to consider hard freezes now and dig the foundation at least a foot deep. This will ensure that you won’t have any issues with frost heaving under your oven. Fill the foundation area with gravel, tamp it down, and level the gravel. For the base, use dry-stacked stone, mortared brick, or concrete block––whatever suits your style and your budget. Start to build the base with the materials of your choice, making a wall thick enough to stand on its own. As you build, you’ll fill the center with “fill.” Fill can be concrete chunks, old bricks, more stone, or whatever else you have access to. 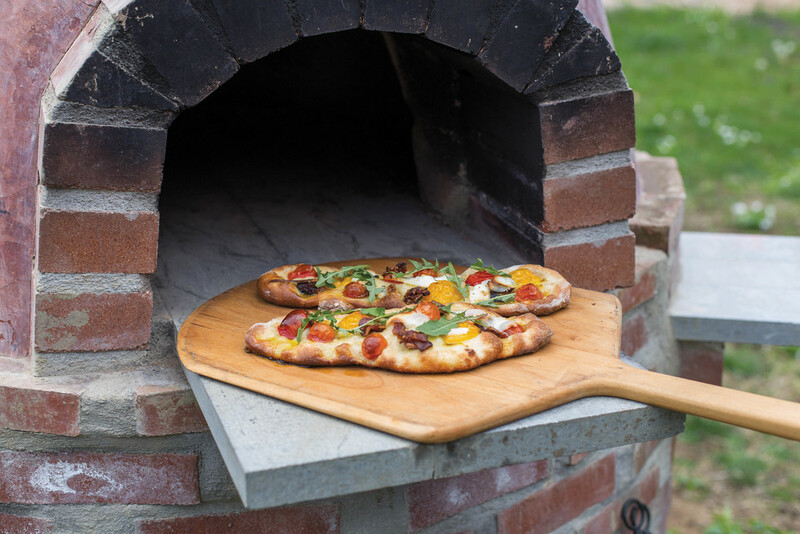 Love the idea of a wood-fired oven but your time or budget makes it unlikely that you can build your own? While the results aren’t identical––and the cooking method lacks some of the romance of an earthen structure––you can use a gas or charcoal grill to approximate the results of a cob oven. Build a fire in your grill: Aim for medium-low to medium-high, depending on what you’re cooking. Lay a baking stone on the grate and let it heat for at least half an hour. Follow your recipe, keeping the grill cover closed to approximate the oven effect of a woodfired oven. When the foundation is about 30 inches high, you will build your supporting layer. This layer will provide insulation to your foundation and retain heat that will reflect back up into the oven. Leave about eight inches of your foundation area unfilled. Pour sand into the foundation until it reaches the top of your fill. Tamp the sand down, adding more as needed, and level it. Cut a piece of plywood into a shape that fits into the foundation. Lay it over the sand and adjust the sand so that the wood layer is level. Lay down a thick layer of slip-perlite mix and nestle empty glass bottles or jars into it. Cover the bottle layer with more slip-perlite mix and then a layer of sand. Level the sand with the top of the base. The refractory layer, which you’ll make using firebrick, is your cooking surface. It also reflects heat back into the oven. Lay firebricks (or salvaged soapstone slabs, as Ashley did in this oven) close together to fill the center. You’re making a bullseye where the firebricks are the center, leaving a margin of about 10 inches of sand and the base wall around the edge of the oven base. Lay a row of bricks to make the door opening to the oven (see illustration). Using damp sand, build a dome about 16 inches high. Start at the door opening. The dome will cover all of the central firebrick, but not the bricks leading to the edge. Work quickly on this step: as the sand dries it will slough off, and might collapse. 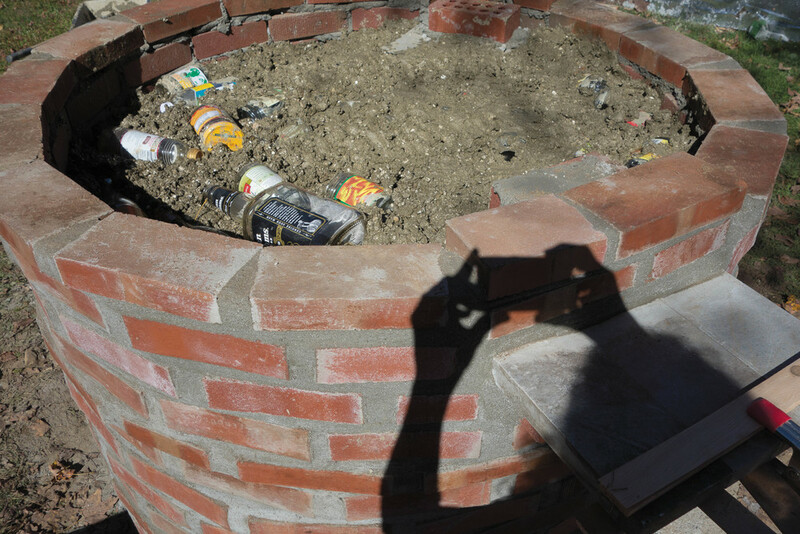 A spray bottle is handy for keeping the sand damp. This step is best done on an overcast, not too breezy day. Cover the sand dome with sheets of damp newspaper. Your thermal mix should be mixed and ready to go when the dome is built. Apply it to the base of the dome, starting from the door-adjacent part. Work, moving around the dome, applying a three-inch layer over the entire dome. Take a deep breath, you’re getting there. Working the same way you did with the inner thermal layer, apply the cob. 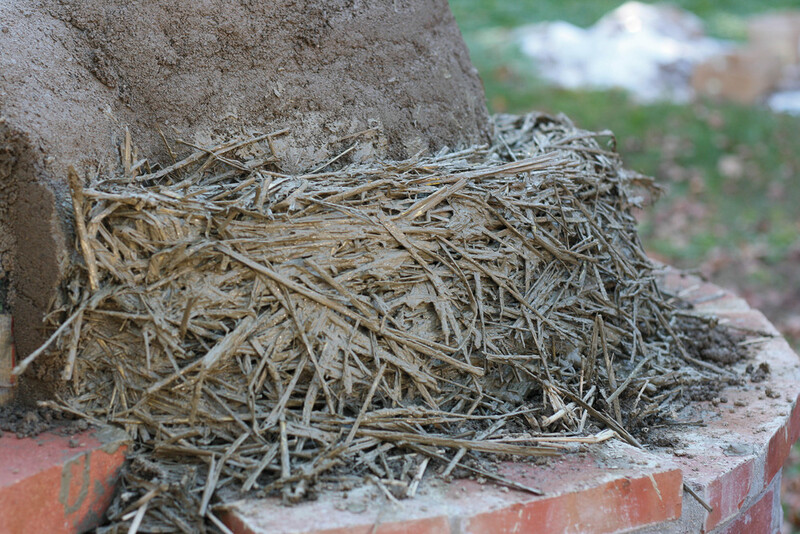 The layer should be thick enough to reach the edge of the foundation. It will be between four and eight inches, depending on how wide your foundation base is. The cob layer serves to insulate the oven and will keep heat inside. A thicker layer is better for insulation, but if you build it too thick (over eight inches) your oven will take too long to heat up. This layer holds the oven together firmly and provides weather protection. Apply it in a thin layer, about ½ inch thick. The finish plaster adds a final level of protection against the weather, but if you are building a roof over your oven, you may choose to skip this step. Choose from lime plaster, earthen plaster, or fireclay plaster (see Resources for websites and books that can help you make the right finish plaster choice). Apply the finish plaster in a thin layer, about ¼ inch thick. Let your oven sit for about a week, to dry out and cure. After a week, remove the sand dome. Just reach in, through the door opening and scoop and brush out the sand inside the oven. You’ll need to build a few small fires in the oven over a few weeks to finish curing it. Build a small fire in the mouth of the oven, push it back into the oven vault, and then add fuel to it to make a small, hot fire. Repeat this process, sweeping out the ash and debris before you build each successive fire. For best results, you should build four to six small fires over seven to 14 days. If you wish, you can build a roof over your oven to keep it dry and ready for cooking year round. You built that nice deep foundation to protect against frost, so why not build a roof and bake in the snow? Mix in perlite or wood chips until the mixture is the consistency of thick oatmeal. Mix together with enough water to make a very dry “pie crust-like” mixture. It should just hold together. The easiest way to mix this is by dumping the mass onto a tarp and stamping on it with your feet. Mix together until evenly combined. A heavy-duty drill with a paint-mixing attachment is the easiest way to do this, but you can mix by hand in five-gallon buckets if you’re not a fan of power tools. Mix in chopped straw until the mixture is thick and moist. You should be able to form a firm brick that holds together. 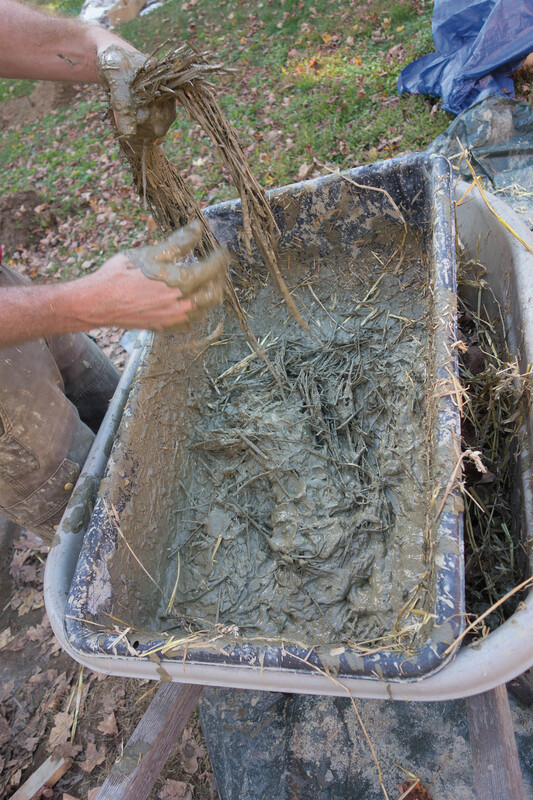 Mix clay and water together. Mix in remaining ingredients.